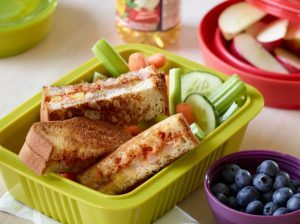 Regardless if you are packing lunch for the office or your kid’s lunch box, this is a critical meal that should not be overlooked. Why is thinking about nutrition at lunch so important? It has been said that breakfast is the most important meal of the day but in fact I believe lunch is tied for first place. Healthy nutrition habits are also critical to keep blood sugar levels constant which helps improve energy, focus, mood and creative thinking. Schools and teachers see a direct link to how nutrition (or a lack of nutrition) can drastically influence a kid’s ability to concentrate, learn and behave. Kids that have poorly balanced meals or simply just don’t eat enough at lunch may be more likely to be “hangry” which is a mix between hungry and angry. In the workplace, businesses spend thousands of dollars on complicated systems and organizational techniques that focus on productivity, when employee nutrition (the most basic solution to productivity) is overlooked. Investing in nutrition education for employees and making sure catered lunches and snacks provided by employers have top-notch nutrition should not be ignored. For more information on how employers can save time and money by investing in health, check out Encouraging Healthy Workplace Habits. What are the top 3 lunch packing mistakes? Skipping lunch is like showing up at an F1 or Nascar race event without fuel in the tank. Your work and school day depend on a consistent and sustained energy fuel to get you through the day. If you skip, expect your energy to dip. The early part of the day is often not the most creative time of the day especially if you are not a morning person. It is also a time of day that most of us are time crunched and parts of your lunch will get missed (even if you have good intentions) as you are dashing out the door. One option is to pack your lunch while you are cleaning up your kitchen after supper. A balanced lunch contains three parts (grains/starches, veggies and/or fruit and a source of protein). Carbohydrates are the sole fuel for your brain and therefore if you miss them you can expect to feel low in energy, find it hard to concentrate and also be more likely to overeat late in the day. Protein is critical for satiety and sustaining energy and therefore if protein is missed you can expect to feel like your energy and hunger is like a rollercoaster ride. If you forget to consume enough veggies and fruit you may find it hard to eat enough of them by the end of the day for health. Why are you opposed to eating at your desk? While we are all guilty of “distracted eating.” You may be tempted to eat your lunch at your desk in front of the computer, taking time to move away from your workspace is key. Not only does this give you a true mental break to help you come back to your office fresh, it helps aid in satisfaction. “Distracted eating” similar to “distracted driving” doesn’t allow you to fully concentrate on the task at hand and will lead to less productivity in general. In a culture that condones mindless eating and multitasking it is also difficult to be mindful and listen to hunger cues and respect fullness if you are eating at your desk or while texting on your phone. Simple rule of thumb is to only eat when you are eating. What are some fast packable healthy lunch ideas? Leftovers from the night before are often the most time efficient way to eat well (include a grain/starch, veggies and a source of protein). Pre-make several black bean quesadillas (grill wraps with cheese, red pepper, green onions, corn and cilantro) and serve them cold or hot in your lunch with sour cream or salsa. Also pack a fruit. If packing a green salad be sure to include a protein such as grilled chicken, seafood, leftover meat, hard-cooked eggs, cheese, legumes, nuts or seeds. Don’t forget a source of carbohydrates for brain fuel. Toss in yams, baby potatoes or quinoa into the salad or alternatively eat your salad in a wrap or pack a bun or whole grain crackers on the side. On the weekend make a big batch of soup, stew, lasagna or other freezer friendly meals and portion these in individual servings in your freezer. Include some raw veggies such as carrots, grape/cherry tomatoes or snap/snow peas and fruit on the side. Pack a healthy bento style box with a selection of items such as cubes/slices of cheese, crackers, raw veggies (such as broccoli and cauliflower), hummus, fruit (such as kiwi, grapes or berries), hard cooked eggs, cottage cheese, yogurt or sliced meat. What can you pack for lunch if you have two of the most common food intolerances (gluten intolerance or lactose intolerance)? Gluten-free bread or wraps are now widely available to make a sandwich with leftover meat or chicken and veggies. Leave salad dressing or hummus at the office in the fridge so you don’t have to pack this daily. Quinoa salad with black beans, red peppers, cucumbers, cilantro and vinaigrette. For another great variation of this recipe check out: Moroccan Quinoa Salad.